I’ve lamented before about my annoyance with the way cilantro is sold. You can get a giant, tangled mess of fresh cilantro for 50 cents, or you can get 4 neat sprigs in the plastic container for, like, $5. What’s a reasonable thing to do when you need cilantro, but you don’t want to waste the majority of the giant bunch you buy? First, you have to store your cilantro correctly. Each time I buy a bunch, I take the time to pull out all of the broken stems (which lead to dry, shriveled leaves quickly) and flyaway leaves at the bottom (which gets slimy and ruin the bunch), trim the stems, and place them in about an inch of water in a cup in the fridge. 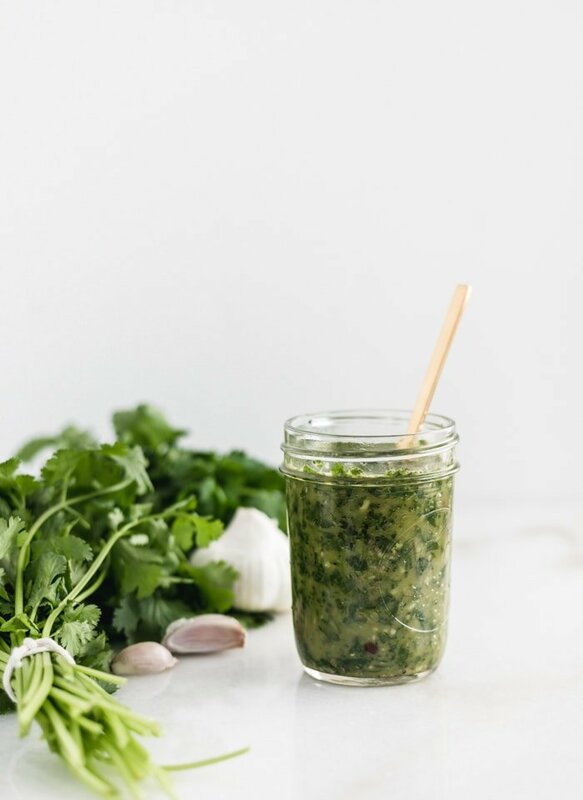 This extends the shelf life, and ensures you don’t forget about the cilantro in the bottom of your produce drawer. I do the same thing with parsley. As much as I hate this extra step, I hate food waste more. Which is why I make chimichurri fairly often. When my cilantro and parsley are getting to the end of their lives as fresh, perky herbs, I throw them in the food processor with some garlic, olive oil, vinegar, and red pepper flakes. It’s a no fail way to use up those fresh herbs in a super delicious way! 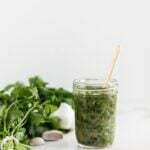 This is the easy chimichurri sauce recipe I use. I know there are a million different ones out there, but I generally do it this way. The measurements are very imprecise, so feel free to adjust to your taste (or what you have on hand). 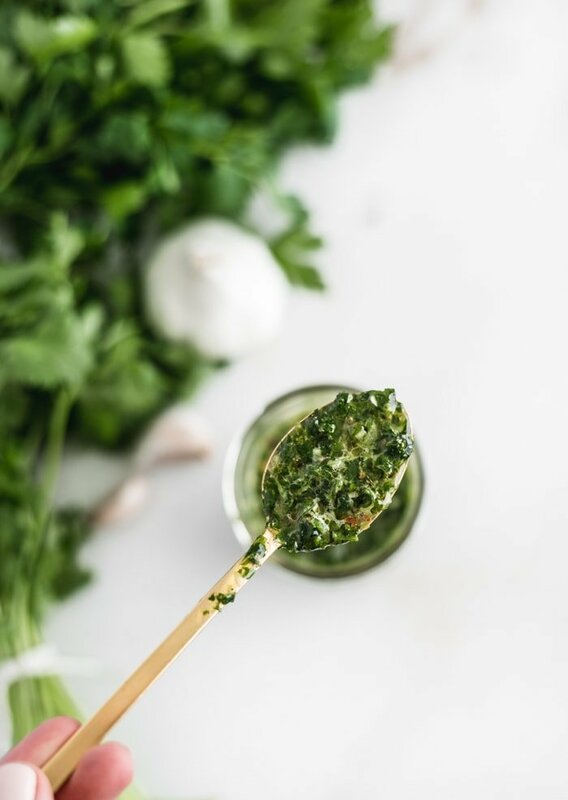 I love this chimichurri sauce spooned over grilled steak, venison, or chicken. It’s also delicious to toss with shrimp or to drizzle on roasted veggies. 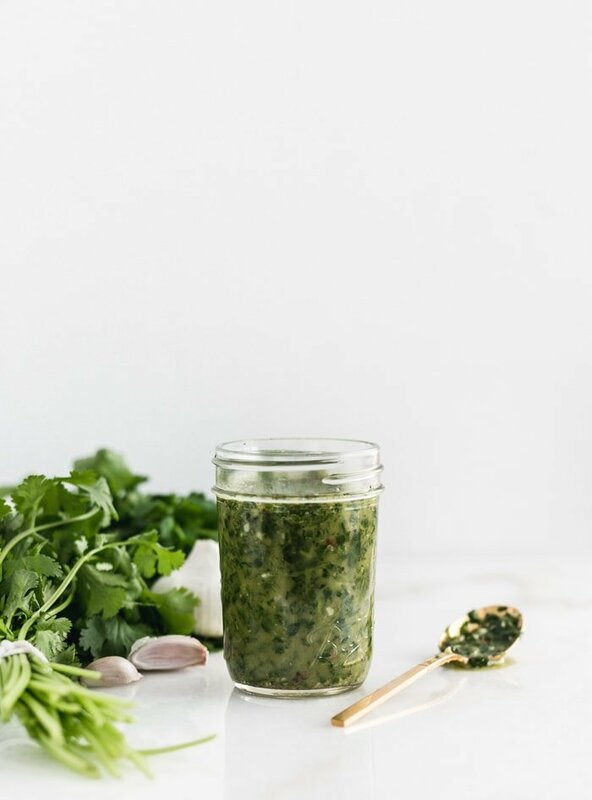 Seriously, if you’ve never had chimichurri, do yourself, and your conscience if you’re anything like me and feel bad about throwing out any food, and make this easy chimichurri sauce! 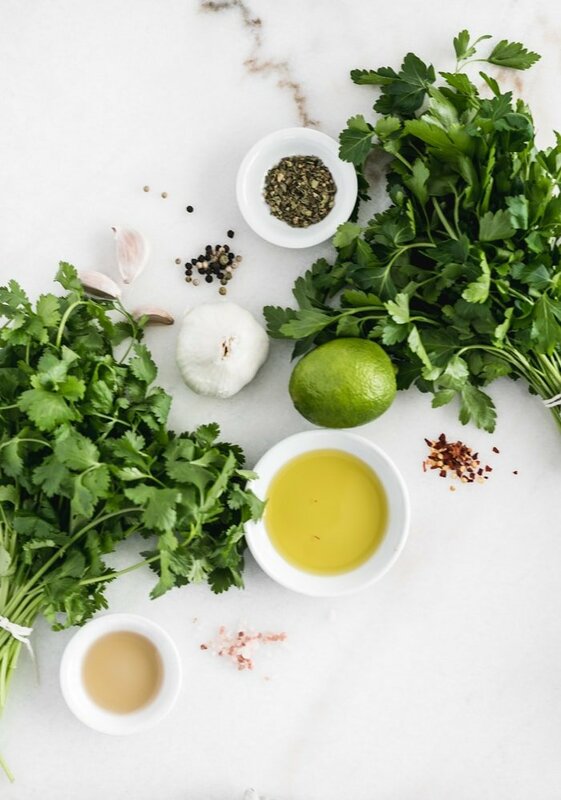 Place herbs and garlic in a food processor. Pulse until finely chopped. Add remaining ingredients and process until blended, adding more water as needed. Pour sauce into a bowl or jar. Store covered in the refrigerator up to 1 week. 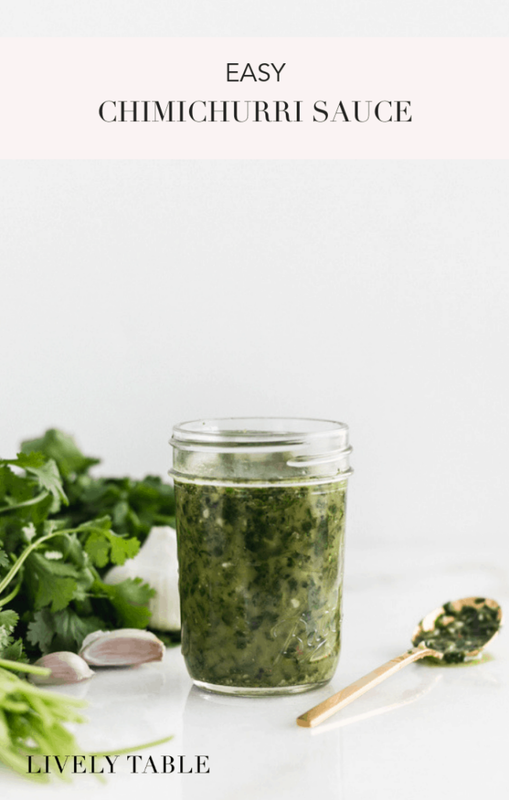 You can also make this chimichurri without a food processor. Just very finely chop the herbs and garlic, and whisk in the remaining ingredients.